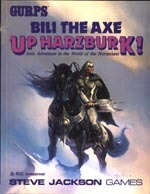 GURPS Bili the Axe: Up Harzburk! 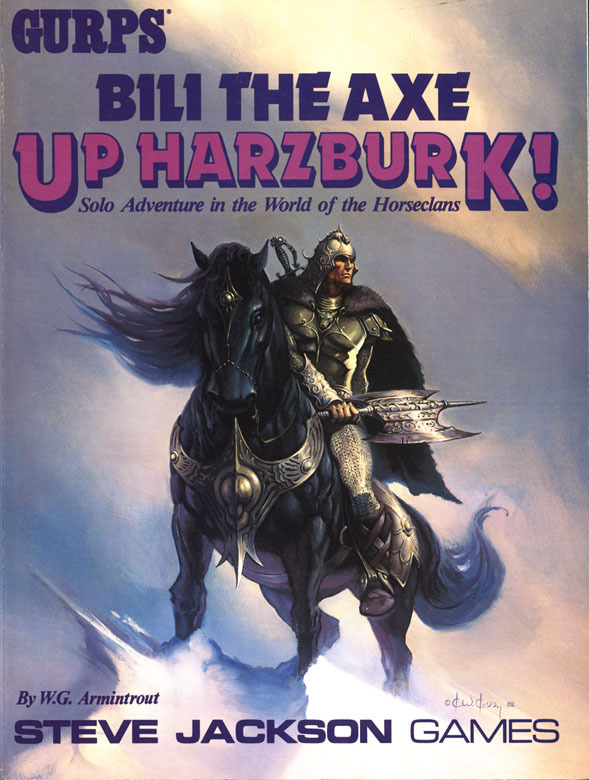 Fostered to the kingdom of Harzburk at a tender age to learn the arts of war, young Bili the Axe must now hack out a career in the royal army. Will he triumph over his foes . . . or die trying? Only you can find out. Accompany Bili the Axe on four years of Middle Kingdoms campaigning, finding adventure (and experience) along the way. Bring your own young characters along, as well – even Bili will need help against the Pitzurk hordes! on the assault ladders and towers! battling in swamps and forests! with the High Lady Aldora, campaigning against the Ahrmehnee mountain tribes! leading the charge against rebellious peasants, professional free fighters . . . even a pike-bristling hedgehog! brawling in the taverns of Harzburk! in the company of the Duchess of Dawfinburk . . . This campaign book is written in "solo" or programmed adventure format. No Game Master is required. You will need the GURPS Basic Set. The GURPS Horseclans worldbook is not required, but can make play more interesting. GURPS Horseclans – They ride the plains of a post-holocaust America, mind-reading prariecats by their sides. They're deadly warriors . . . for honor, for loot, or just for the joy of a good fight. The Horseclans solo adventure Up Harzburk! was recalled soon after publication, in early 1989, because it contained so many path errors that we did not feel it could be adequately corrected by an errata sheet.